Whether you're playing casuals, concerts, weddings, or clubs, you'll find the music you need with Strings Charts. These elegantly engraved editions, accompanied by helpful instruction and performance notes, offer artfully arranged interpretations of popular rock, jazz, and roots music, along with fresh new alternative-styles original compositions. And if you teach, you'll also discover wonderful material for beginning and intermediate student ensembles. Embrace the lighthearted romanticism of “Can't Help Falling in Love,” ideal for weddings, cocktail parties, and other casual gigs. “Love Me Tender,” one of Elvis' most beloved ballads, is a classic that's rewarding when played with heartfelt sensitivity. Add these popular Elvis love songs to your repertoire and be prepared for any romantic occasion. Perfect for our quartet! Really nice harmonies and fits together well. We would buy more of these if available. Some Kind of Wonderful". It has a bouncy, nervous quality to it, that could be fun to play at party or cocktail hour. But if the Bride is looking for the slow and swingy Elvis Blue Hawaii version, this is not the arrangement for you! 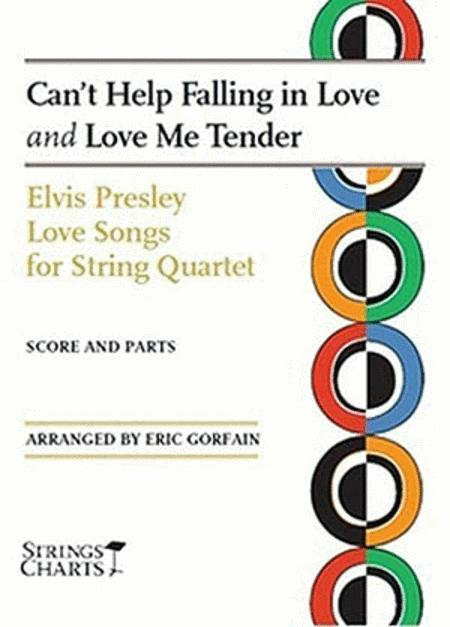 The graceful arrangement of Love Me Tender is the well known tune in a more traditional 4 part harmony. opening measures are important for the rhythm and a little confusing to get the feel of the music until the group plays the entire pieces a few times.